Fall is here and it is time to start decorating. As the days get shorter, we tend to stay inside more. With the holidays approaching, it is a good time to start thinking about your Fall and Thanksgiving decorations. 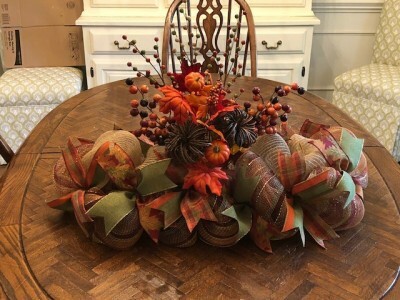 This is truly a gorgeous centerpiece made from deco mesh, berry sprays, grapevine pumpkins, and beautiful Fall ribbon. Every inch of this centerpiece was hand made by me. One of my favorite things about this centerpiece is the ability to take out the center for easy storage.